San Francisco-native Carolyn Grey had already established herself as a popular radio vocalist on the West Coast when she joined Gary Nottingham’s territory orchestra in early 1941. She soon caught the attention of Woody Herman, who hired her that summer. Grey quickly became Herman’s featured attraction. She remained with the band until suddenly quitting in May 1943, the day of the orchestra’s opening at the Hollywood Palladium, leaving Herman without a female singer for the duration of the engagement. In October 1944, Grey signed with Sonny Dunham’s band, appearing with them in one short, and in late 1945 she made a soundie under her own name. She was singing with the D’Varga combo, the intermission band at the Hollywood Palladium, in January 1946 when Gene Krupa, whose band was featured at the club that week, borrowed her as a last minute replacement for the suddenly departed Anita O’Day. O’Day had given notice to Krupa that she would leave the band at the end of their Palladium run, but after getting ill she quit early, thirty minutes before they were scheduled for a coast-to-coast radio broadcast. Krupa liked Grey so much that he hired her permanently. 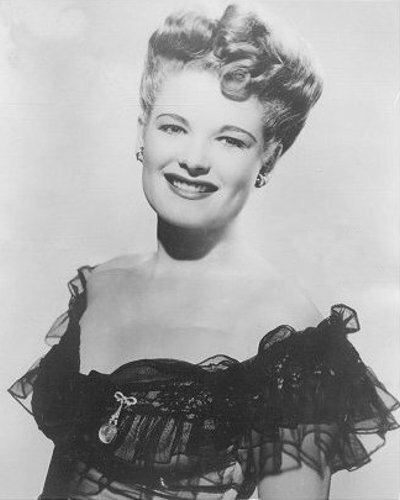 Grey reached the height of her popularity while with Krupa, being named sixth most popular female band vocalist in Billboard’s 1947 disk jockey poll. She appeared with the orchestra in several films and shorts. In July 1946, she married Herman’s road manager, Joe Dale and soon became pregnant, leaving Krupa in April 1947. The couple had a daughter in August. Grey retired from touring in February 1948 to settle in Hollywood, hoping for film and radio work, but by October 1949 she was back on the road, performing as part of the bill at the Paramount in New York. In March 1951, she joined Jerry Wald’s orchestra, staying a short while. In 1953, she recorded on the Jig-Saw label and in 1954 on Vito. “Carolyn Grey.” IMDb. Accessed 30 Dec. 2015. “Gary Nottingham to Open Saltair Season Tonight.” The Deseret News [Salt Lake City, UT] 30 May 1941: 15. “Vaudeville Reviews: Earle, Philadelphia.” Billboard 3 Jan. 1942: 25. Smith, Ed. “Two Eye-Filling Attractions with Woody Herman's Band.” San Jose Evening News 17 Apr. 1943: 8. “Herman Hit Hard by Loss of Soloists.” Billboard 5 Jun. 1943: 20. “Music Grapevine.” Billboard 7 Oct. 1944: 20. “Music-Cocktail: D'Varga.” Billboard 19 Jan. 1946: 34. “Music as Written.” Billboard 2 Feb. 1946: 22. “Advanced Record Releases.” Billboard 23 Mar. 1946: 32. “Music as Written.” Billboard 26 Apr. 1947: 23. “Time Out.” Billboard 3 Aug. 1946: 24. “Jocks Tab Top Chirps.” Billboard 2 Aug. 1947: 20. “Births.” Billboard 9 Aug. 1947: 49. “Music as Written.” Billboard 21 Feb. 1948: 35. “Vaudeville Reviews: Paramount, New York.” Billboard 8 Oct. 1949: 47. “Music As Written.” Billboard 31 Mar. 1951: 20. “Popular Record Reviews.” Billboard 20 Jun. 1953: 54. “Music as Written.” Billboard 3 Aug. 1954: 38.